"In ten days I shall be in your palace in Tarantia, with my warriors. What word from you shall I say to your women... before I flay their dainty skins, for scrolls whereupon to chronicle the triumps of Tsotha-Lanti?" 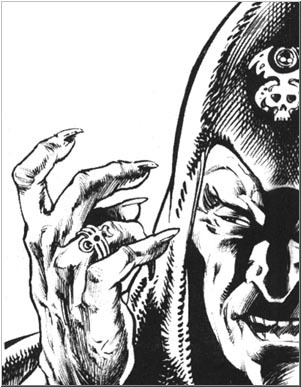 -- Robert E. Howard: "The Scarlet Citadel"
Physical Appearance: A thin, wizened man with claw-like fingers, his body concealed beneath rich, volumnious robes. His cackling speech mimics his alias as the Vulture. Background: It is said that Tsotha-Lanti is the spawn of the mating between a demon and a dancing-girl of Zamora. This secretive being inhabits the Scarlet Citadel, which adjoins Strabonus' palace in Khorshemish. Tsotha-lanthi's citadel contains horrors that those few who have entered and returned only hint at. For most Hyborian kings, association with sorcerers is an act of desperation; for Strabonus of Koth, Tsotha-lanthi has become an integral part of his government. Role-Playing Notes: Tsotha-Lanti is wholly perverted by evil. According to rumors, he keeps young boys in his seraglio in the Scarlet Citadel. He performs terrible experiments in his extensive dungeons, which are filled with all manner of abominable creatures. Spells prepared (4 6 5 5 5 5 3 2 1; base DC 15 + spell level): Arcane Mark, Daze, Mage Hand, Resistance; Burning Hands (x3), Hypnotism, Mage Armor, Unseen Servant; Detect Thoughts (x2), Hypnotic Pattern (x2), Locate Object; Dispel Magic (x2), Feign Death, Hold Person, Magic Circle against Evil; Detect Scrying, Evard's Black Tentacles (x2), Scrying, Wall of Fire; Animate Dead (x2), Nightmare, Telekinesis, Wall of Force; Circle of Death, Planar Binding, True Seeing; Spell Turning, Teleport Without Error; Symbol. Equipment: Major Cloak of Displacement, Ring of Regeneration, spiked ring with one dose of Purple Lotus, several doses of Stygian tomb-dust. Notes: Tsotha-Lanti has cast a Contingency spell which activates a Dimension Door if he is brought below 25 hit points, through which he will attempt to escape. If encountered in his Scarlet Citadel, the sorcerer can draw upon monstrous allies as diverse as giant serpents and carnivorous plants.